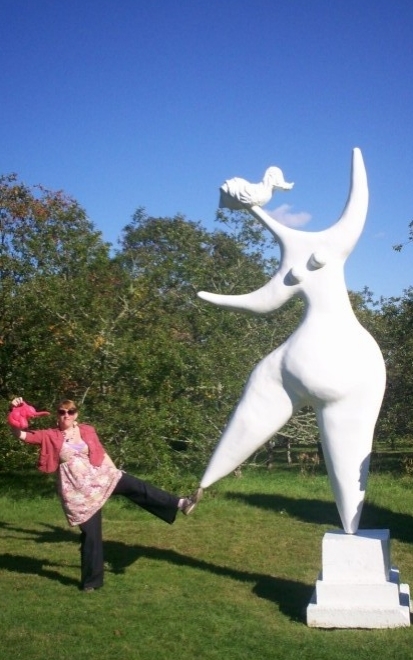 Here I am at the sculpture park of the Field Gallery in quaint West Tisbury of Martha's Vineyard. My mother used to rent a house in MV every Columbus Day weekend. The house was sold a few years ago. I am sorta mourning the loss of it today as the long weekend approaches. If you ever get a chance to go, I recommend. This time of year is absolutely perfect. I've even snuck in some swimming on the really warm Columbus Days and Memorial Days of past. That adorable Pink Elephant watering can is from across the street from the Field Gallery, Alley's General Store. It is really one of those old fashioned general stores with more this, that and the other thing than you could imagine. I still have that watering can, though it's faded to a White Elephant. She lives in the Container Faerie Garden on the Patio, and she is in very good company.